Well...it looked right when I typed it, but you're right, it doesn't display correctly. Oops. I'm sure he'll figure it out. Speaking of your Vegas books, any revised editions on the way for Vegas 7? A new version of the Vegas book was written for V7, but at about the same time it was submitted in parts, CMP was purchased by Focal. Focal hasn't moved. We have another Vegas book coming reasonably soon. I admire you guys. I revised a book from Premiere Pro 1.0 to Premiere Pro 1.5 and it was more work than I ever want to do again. I found my niche. I get paid to follow the instructions in other people's books as they write them. Not as much money, but much easier, by far. Writing technical books is tough. Very tough. I have seen some of the Vegas books and they look pretty good. And, I really like the way Focal produced Tim Kolb's book on Premiere Pro. Great color pics. So maybe working with Focal will work out for you. 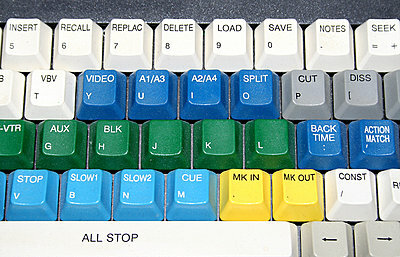 And for those folks who started editing after video became more common-place than film in corporate production, but long before the e=mc2, avid, cube, fcp, vegas, etc., it was also referred to as a "split-edit" on many machine controllers. I won't give up my vegas, but it was fun to have a 286 computer with a full-control keyboard with jog/shuttle, running 4 BetaCamSP decks, an audio mixer and a video switcher all in sync. Well, at least they were usually in sync by the time their 5-second preroll was completed... I got pretty good at reading looooong printouts of timecode numbers. DSE covered this really well, but since you use FCP, I figured visuals from an actual FCP timeline might make things even clearer. These are shrunken screen grabs from my DVD series StartEditingNow - that I use to illustrate J-cuts and L-cuts. 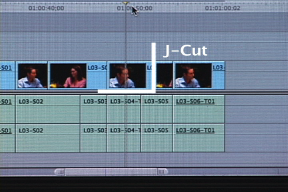 The basic point is that in a J-cut - the audio keeps rolling across the video edit. 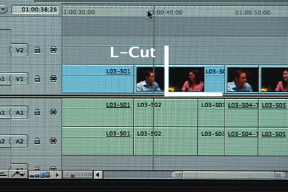 In an L-cut the video keeps rolling across an audio edit.